The White House emphasizes freedom of expression, "a bedrock principle in our democracy"
(CNN) -- Was it a debate? A berating? A surreal televised "stunt"? No matter what you call radio host Alex Jones' appearance on "Piers Morgan Tonight," one thing is certain: It's generating a great deal of social media buzz. On Tuesday morning, Jones was a top-trending topic on Twitter as people read about the interview, watched clips online or shared their thoughts after watching Monday night's fiery exchange live. The man behind a petition to deport Morgan back to the UK for expressing his views on gun control went on the attack, calling the CNN host "a hatchet man of the new world order." "1776 will commence again if you try to take our firearms!" Jones yelled. "It doesn't matter how many lemmings (mindless followers) you get out on the street begging for them to have their guns taken! We will not relinquish them! Do you understand?" Will the new Congress act on guns? Morgan has pushed for stricter gun control regulations since a gunman killed 27 people before committing suicide last month in Newtown, Connecticut -- 26 of them in a mass shooting at an elementary school, including 20 children. "I'm in favor of a nationwide ban on military-style semiautomatic assault weapons and high-capacity magazines," he said as he opened his Monday night show, before introducing Jones. Alex Jones: "The Republic will rise again when you attempt to take our guns"
Jones' petition, posted on the White House website, accuses Morgan of being "engaged in a hostile attack against the U.S. Constitution by targeting the Second Amendment." It has more than 100,000 signatures. 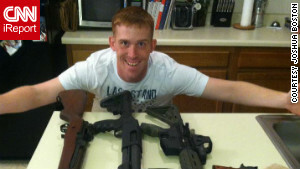 Morgan prefaced his confrontation with Jones with a live report on Monday's testimony in a preliminary hearing for Aurora movie theater shooting suspect James Holmes and a live interview with relatives of two victims who died in a hail of bullets from a military-style rifle in that shooting in July. "I appreciate you having your First Amendment right. I am glad you are speaking out," said Dave Hoover, whose nephew died in the movie theater. The White House also made reference to First Amendment freedoms, in a statement Monday night. "The White House responds to all petitions that cross the threshold, and we will respond to this one," spokesman Jay Carney said, referring to petitions on whitehouse.gov that get at least 25,000 signatures. "In the meantime, it's worth remembering that freedom of expression is a bedrock principle in our democracy." 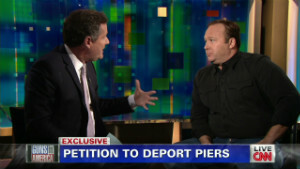 Jones thanked Morgan for having him on the show, and then said he and others started the petition to point out that "we have all of these foreigners" and globalist forces, including "megabanks that control the planet," trying to take away American guns. "When they get our guns, they can have their world tyranny," he said. Morgan's attempt to interject questions ran up against Jones' heated chatter, leading up to a crescendo with Jones reciting a list of despotic world leaders who he said took away guns: Hitler, Stalin, Mao, Castro, Chavez. As Jones continued, Morgan looked on, tight-lipped and silent. After 2½ minutes, Jones rounded off his monologue with a friendly offer to take Morgan out shooting, so he could "become an American" and "join the Republic." He also offered to climb into a boxing ring with Morgan. At the end of the interview, he imitated the Briton's English accent, before declaring him a "Redcoat" who should go back to where he came from. Morgan asked: "Are you finished?" Jones said: "Yes." Then he began a tirade against makers of antidepressant drugs. Jones said he owns about 50 weapons. His radio show can be heard on 140 radio shows around the country, he said. Morgan says Jones' rant backfired, making Morgan's point for him. "I can't think of a better advertisement for gun control than Alex Jones' interview last night," he said Tuesday on CNN's "Newsroom." "It was startling, it was terrifying in parts. It was completely deluded. It was based on a premise of making Americans so fearful that they all rush out to buy even more guns." "I think silence was the best weapon against him because he just dug himself an ever bigger hole," Morgan said, adding that Jones "spouts dangerous nonsense." Jones, on his website infowars.com, had an image of Morgan dressed as a "Redcoat" next to Jones himself dressed as a "patriot." A summary of his plan for Tuesday's radio show said he would discuss "his effort to defend the Constitution and the Second Amendment from attack by the establishment media as the government prepares its latest gun-grabbing assault on law-abiding Americans." The description adds that through the interview, "we have put the globalists on notice." On the program, he said that 95% of people he has heard from "think that I just told it like it was" and "slammed them hard," delivering an important message. "I have been overworked," Jones added, describing a busy schedule. "But I did the best job I could and I'm proud of the job I did overall." Responding to Morgan's depiction of how the interview went, Jones asked whether that was because he is "a hillbilly that won't be your slave and knows history." He described Morgan as being like "a mannequin, a vampire." Though many found fault with Jones' performance, some found common ground with his arguments. "The tact with which Jones presented himself with was inexcusable. However; looking past that (I know... hard to do especially after that English accent he so offensively portrayed)... I have to say that his statistics were much more compelling than Piers's. I mean, ok, gun violence is higher here in America... but it has a lower violent crime rate than those countries with banned fire-arms?" PhilipCabibi wrote in the comments section of this article. "I see where Jones was trying to go, but unfortunately, he presented his facts in such a manner that it will turn most off to them. Which is unfortunate... because no matter how rude someone is, it doesn't change facts and it doesn't change history." Reactions on social media were blunt. New York University journalism professor Jay Rosen called the interview a "meltdown" and called Jones "revolting." James Poniewozik, TV columnist for Time -- which, like CNN, is part of Time Warner -- wrote, sarcastically: "Shocking: You reward a lunatic on TV for pulling a stunt," and he fails to "behave with civility." Facebook user Steve Spark made similar comments in a CNN discussion. "If you have a nutjob as a guest, you can't be surprised when they act like a nutjob," he wrote, adding, "Some might say it makes for good TV, but I think it's just embarrassing." 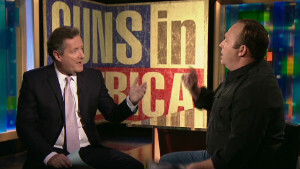 The Huffington Post summarized the program this way: "Piers Morgan's pro-gun guest goes absolutely nuts at him." Jones retweeted a supportive note from Gerald Celente, who has 36,000 followers. "Bravo," the tweet said, praising Jones for "punching out CNN Presstitute Piers Morgan." CNN iReporter Jason Asselin posted a video saying he believes that Morgan has no right to debate gun control in America, and that only U.S. citizens should do so. Jones' appearance on "Piers Morgan Tonight" was followed by an interview with famed attorney and Harvard law professor Alan Dershowitz. "We lawyers refer to people like that not as witnesses, but as exhibits," he said of Jones. "He was an exhibit, like a piece of evidence. You see him speaking and you say to yourself, 'I don't want that man to have a gun.'" Dershowitz said Americans who want even-handed gun policy should not leave the arguments up to gun advocates such as the National Rifle Association and Jones without speaking up themselves. "We have to fulfill what the real meaning of the Second Amendment is: reasonable access to guns for self-protection and for hunting. And there's no room in America for these semiautomatic, automatic and other kinds of weapons that are simply designed to cause mass havoc," Dershowitz said. 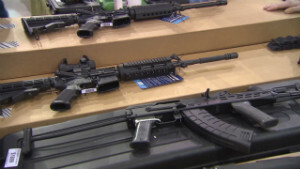 In addition to the limitations on military-style rifles, Morgan wants gun show loopholes closed and demands that gun dealers be required to run background checks on purchasers at shows. He also advocates an increase in federal funding for mental health treatment to anyone who needs it. Morgan recently wrote a column in the Daily Mail saying that for every critic, he has had many Americans thank him for speaking up in favor of gun control. "If you don't change your gun laws to at least try to stop this relentless tidal wave of murderous carnage, then you don't have to worry about deporting me. "Although I love the country as a second home and one that has treated me incredibly well, I would, as a concerned parent first -- and latterly, of a one-year-old daughter who may attend an American elementary school like Sandy Hook in three years' time -- seriously consider deporting myself," he wrote. Post comments below, or join our discussion on Twitter.